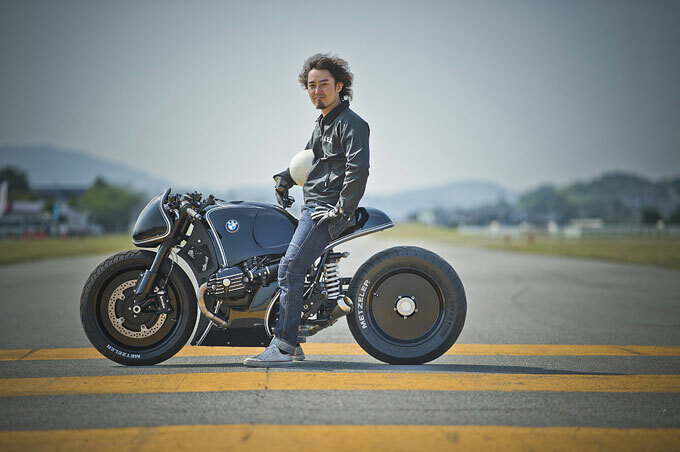 This is Cherry’s Company BMW R nineT Custom Project the “Highway Fighter” which is part of the custom project that four Japanese bike builders 46 Works, Brat Style, Hidemo and Cherry’s Company are currently unveiling. Many of you will have seen this on Bike Exif, but there simply wasn’t enough pics on there of my favorite the Highway Fighter. Taking a stock BMW R NineT the 18″ front and 16″ rear wheels have been modified from ChromeRevTech Billets and lavished with Metzeler ME880 Marathon tires. A bunch of frame, fork and brake modifications have been applied with some extremely sick styling and custom fabrication options, which are plain to see. This quite possibly is one of the best bikes I’ve seen this year and shows how important the NineT is going to be to the custom market. Exactly what BMW intended to happen when it launched last year.